Have you ever seen the internet? Touched it? Smelled it? 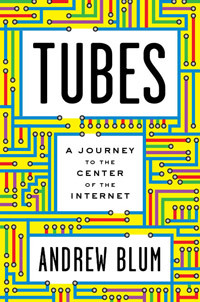 In Tubes, a run-in between a squirrel and a cable in his Brooklyn backyard sets Wired correspondent Andrew Blum on a quest to discover the physical stuff of the web. He chronicles encounters with network operators, cable guys, and computer scientists as he travels the globe—from Oregon, where thousands of hard drives in hulking data centers hold up the “cloud,” to Portugal, where the ship Peter Faber is laying the start of a 9,000-mile fiber-optic cable under the Atlantic. “Everything around me looked alive in a new way,” Blum writes as he envisions the world pulsing with glowing fibers. But ultimately he comes around to the obvious: that the true vitality of the web depends on the people who inhabit it. Should Idiots Be Allowed to Regulate the Internet? Is Your Gmail Account Killing the Planet?